We are involved in trading and supplying a wide range of Blasting Gloves. These are sourced from trustworthy vendors of the industry, who manufacture these using high quality leather and following international industrial standards. 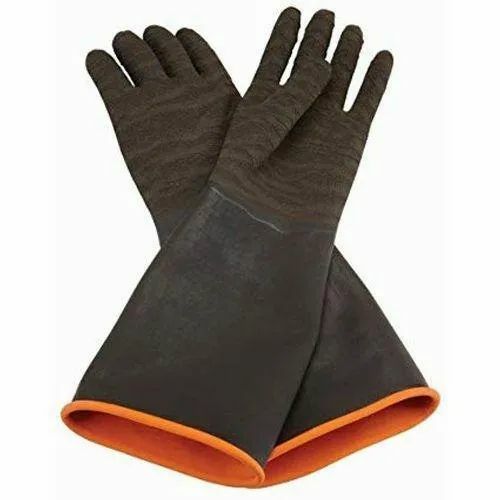 These are extensively recommended by clients to provide maximum safety to hands from various harmful chemicals in industries. these are available at reasonable rates. Having experience of more than two decades, we are a leading organization engaged in trading and supplying of metal shots and allied machines and equipments. Our Product range is Steel Shots, Stainless Steel Shots, Aluminum Shots, Steel Grits, Corn Cob Grits and Natural Grits. Along with these, we also offer Ground Walnut Shell Grits, Aluminium Oxide, Glass Beads, Silica Sand and Cut Wire Shots under this range. The clients can also avail Airless Shot Blasting Machine and Sand Blasting machines (Portable Type and Cabinet Type) from us in standard as well as customized forms.And all Spare Parts of above machines available like Control Cage, Impellers, Liners of All Type, Rubber Sheets, Glass Beeds, End Less Belt Buckets, Hose Pipe, Nozzles, Slica Sand, Garnet Sand etc. We also deal in Electric Spray Equipment for Quick Coating, Commercial Painting Equipment and Sundries, Spray Tips, Filters and Accessories, Airless Hose, Hose Fitting, Paint Mixers, Surface Preparation Equipment, Climate Condition Testing Equipment, Dry and Wet Film, Materials Thickness Gauges, Blast Lights, Blastine Ventilation Systems, Electric and Pneumatic Extraction Fans,Internal Pipe Cleaning and Coating Equipment and Blast Abrasives.